It’s taken me a bit of time to gather my thoughts from our club experience to Futbol Salou and Barcelona, earlier on this year. Maybe it’s because I’m feeling nostalgic of late, as the curtain is beginning to fall on the U14 season here in Mayo and the team which I adopted on my return to Ireland in 2012, sets it’s sights on the final week of what started out as a wonderful year for them. Or maybe it’s because I have just booked a little trip back to Barcelona for Baylee and I at the end of September, to grab a game at The Camp Nou, relax with some tapas and enjoy the last of the Summer sun in Europe. Whatever it is, writing about the experiences of our club’s time in Barcelona with DB Sports Tours during April 2014 will not flow easily, as the memories are vivid enough to make my mind constantly wander. Late September 2013, I made my first grumbling questions towards the parents about a trip away at Easter 2014 with our group of players. I wasn’t sure how this would go down. It wasn’t something that was really done in these parts, but I knew that there would be an education for all involved, so I called a meeting on it. I looked into competitive action in the UK, as well as a trip to Munich, to study and train like the new (now former) European Champions, before putting forward my final suggestion of a 5-day football education package to Futbol Salou and Barcelona, to train in the Catalan way, play against Catalan teams and discover the Capital City of Catalunya. This seemed like the natural progression and choice for me and the club. Our recently renewed goals at Killala FC put player development at an absolute priority over a “win at all costs” mentality and Barcelona are the world leaders of that philosophy. 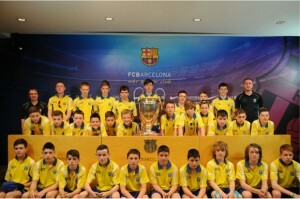 When Darren from DB Sports pitched the idea of master training sessions carried out by Catalan coaches, in the Catalan Way, I was happy to take that back to the parents, knowing that this journey would be one where our players would see that Killala FC are attempting to model a player development pathway, which mirrors the best in the world. The parents loved the idea. Mainly to have the kids away for 5 days during Easter break but also knowing that they would have fun, whilst learning different cultures on and off the field. Thankfully the parents trusted the tour committee also and the plans were cemented to take our two groups of 30 kids (U13/U15) to Futbol Salou in Easter 2014. We had 6 months to prepare everything from kits, to bags, sponsorship and training gear. Thanks to the assistance of many people, they boys were looking like the professionals they were going to be for the next 5 days. They rocked up to Dublin Airport, all looking the same in their club travel wear – almost professional enough to be asked for their autographs at the departure gate. Before this though, a lot of work had been done behind the scenes to ensure this trip was buttoned up and the boys were going to be able to soak up as much football over the 5 days as possible. Darren Scully from DB Sports Tours worked tirelessly with my – sometimes sticky – demands, to ensure the itinerary had the appropriate schedule to suit what I wanted to achieve from the trip. I’m a stickler for professionalism, punctuality and schedules, but I felt at ease once Darren sent me through the final draft of our itinerary a week in advance of our departure. From the moment we departed from Killala, Co. Mayo, until the exact hour we arrived back to our beds 5 days later, each interval and event was transparent. Now all that was left to me and the rest of the coaches was to run a tight enough ship, that our schedule flowed as well as described on paper. 5 days – packed with 2 Master training sessions, 2 games, a tour of The Camp Nou, an RCD Espaynol La Liga game, all breakfast, lunch and dinners supplied and squeeze in some time for swimming pool antics and maybe a rest or two in between. We were ready! Once the boys arrived in Camp Cambrills, Salou, I think they finally realized they were here to learn, but also have fun. Swimming pools, beaches, their own cabin with their friends – mix that in with some football training and games and what lad wouldn’t be buzzin’! But they had no time to explore just yet. As soon as they arrived, they had to get into their training kits for the first Master training session at Futbol Salou. A quick walk from our lodgings, the boys walked out onto the turf and met their Master Coaches and thankfully our sleepy boys could understand their decent English, which was even more understood when the boys heard the word “Rondo“. One of the lads came over during a water break and said to me “Pete, they must have seen you doing this Rondo craic before, cos this is what we do to warm up every training session“. Knowing the smart lad who said that to me, I knew the comment was tongue in cheek and quite witty for someone who had been awake for so long, but I was happy that the lads were seeing a natural progression from our training sessions at Killala FC, to the professional setup here at Futbol Salou. After a labored trek home, a quick dip in the pool and an introduction to Spanish cuisine in the restaurant on-site, the boys slept very easy and didn’t argue with my strict curfew that night. Time for a cold one for the coaches and meet some of the other coaches visiting the complex. The next day included an early wake-up call for some sleepy heads, a fresh breakfast, then some pool time. Clearly this was time for the boys to bond, whilst bombing down water slides and chilling out by the pool. A fantastic experience and as coaches, we were very happy to allow this time for both groups to interact with other teams who were at the complex. Some stayed near the water, some challenged other groups to 5v5 on the football court or basketball court and some stayed out of the sun and chilled by the pool or in their rooms for a while. It was very interesting to capture all the characters of kids being away from home the first time without their parents. Later that afternoon, as a mandated rest period, the boys went on to play their first games vs local opposition. For the lads, this was their Champions League. Playing against Spanish teams was proving a fascinating task an the opposition proved to be very testing, which was great for the players. The U13′s narrowly lost out 2-1 to their counterparts from a local club, while the U15′s found it a little tougher, but did find themselves on the score sheet twice, which was a result in itself. Results for the coaches were how the players were able to see their opposition play; their focus on the ball at all times, keep it, keep it, probe, be patient, every player comfortable and composed on the ball and of course, some individual flair – Hopefully a lot learned. The next day was Sunday and our “day off”, however the fact was it was far from a day off. Darren had our day packed tightly and we were shipped off into Barcelona City, where our first venture was a tour of The Nou Camp. Sleepy heads were again woken pretty fast, as the first part of the tour brings you through the vast, seemingly never-ending, trophy room. The boys could see the pinnacle of development, and while most of them could only dream for now, I reminded them that hard work and persistence might just get one of them lifting a Champions League trophy one day. I like people to dream big! The rest of the tour took them around the hallowed turf which the great Messi frequents to mock many back 4′s on a weekly basis, into the dressing rooms, the press boxes and video rooms, where it was tangible that the lads were day dreaming of bigger things and playing with a crowd screaming your name. I hope that happens for some of them someday. As they finished, they visited the superstore. He’s where most of their allowance went. Plenty of jersey’s and souvenirs for back home to show their jealous friends, then on into Barcelona City for lunch and a few hours to explore the ancient City. Trying to keep tabs on 30 young lads in a busy street isn’t easy, but the coaches were on their toes and everyone was accounted for when getting on the bus to our next stop, RCD Espaynol for a La Liga game. Barcelona is a beautiful city and one which I can;t wait to get back to, but I was glad to get out of it after having eagle eyes on 30 lads from little old Killala and all their wonder an awe on the tall old buildings. The game was a chance for the boys to relax and watch Espaynol play in the Catalan Way. Again, all possession based play from the back. Again, more boys commenting to me that “we do that already, Pete”. Happy days, now they know I’m not asking them to do something crazy and they could see the finished article and how it looks like in a professional game. More jersey’s and junk food were bought. It was a day to let them have some liberation with regards food, as we had mandated a good clean diet leading up to this. And they are kids after all. No need for a curfew tonight. Tired bodies just dropped into bed after coming home, knowing they had a training session and a game to perform in tomorrow. In hindsight, if we were a “professional” Academy, our restrictions on diet and fluid intake during our day trip to Barcelona would be a lot stricter. Truth is the following morning, the boys were sluggish, tired and lacked motivation for their second Master training session. After an action packed previous day, we had a few injuries and a lot of tired minds, but all the lads could see the natural progression from the previous session and were delighted there was some shooting practice added in to hit the back of the net. Back for lunch after the session to Camp Cambrils and I wasn’t flavor coach of the day, as I mandated no pool time, simply rest, listen to your music and stay out of the sun to prepare for the late afternoon games. The games came around and the boys were happy with the rest, as the heavy schedules of the past few days caught up with them. They didn’t fare out as well in these games, but perhaps learned a lesson on game preparation. Maybe having a small look into the life of a professional, with a coach like me making their life “miserable” but having their interests in mind. The boys were disappointed with their display, as they have high expectations of themselves now. They know they are playing the type of football their Spanish counterparts, but they would have liked to come away with a victory. It wasn’t to be, but when both groups posed with their new Spanish friends for a picture after the game, I knew we had achieved a lot from this trip. More than any scoreline could produce. That night, the curfew was put back by an hour and the lads were allowed soak up the last part of the atmosphere on their experience to Camp Cambrils. A few stayed out until the last moment, but most were happy to unwind in their little shacks and sleep off the memories of the past few days. The behavior of the lads was nothing short of perfect over the duration of the trip and that couldn’t have been achieved without the itinerary form DB Sports being so well organized and the coaches on hand to facilitate the fluidity of operations. Earlier I mentioned I was a stickler for everything professional and I think the boys got a good sense of that during the trip. It had to be though. As a club we wanted this trip to be an education on many levels. We wanted it to develop, not only football players, but young lads away from home. How to act like a pro and how to experience and respect differing ways and cultures. I hope each player and coach learned something from the trip. I would like to thank Darren, David and Rian from DB Sports Tours for playing a pivotal role in making this a memorable trip for Killala FC. Thanks to the coaches, local businesses and the parents for facilitating the operations to make this trip possible and finally, thanks to the players for willing to learn and experience this with me and the rest of your club members at Killala FC. We are all very proud of you and hope you continue to play and learn in the Killala Way!